For the 2018 Texas governor's debate featuring Gov. Greg Abbott and Lupe Valdez, click here. 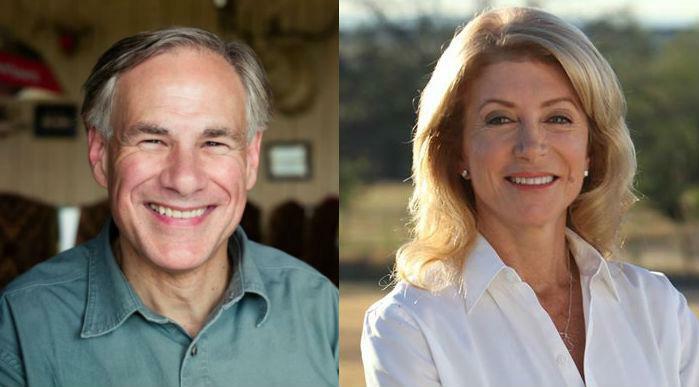 KERA, the North Texas public television and radio stations, hosted Attorney General Greg Abbott and state Sen. Wendy Davis in The Texas Debates: Race for Governor. The one-hour live debate was a co-production with NBC 5/KXAS-TV, Telemundo 39/KXTX-TV, and The Dallas Morning News. It was broadcast on Tuesday, Sept. 30 at 8 p.m. CT on television, radio and online. Catch up on our debate live blog here. The Texas Debates aired live on KERA-TV Channel 13, KERA 90.1 FM, COZI-TV Channel 5.2 and other radio and television stations across the state and nationally on C-SPAN; it streamed live at texasdebates.org, NBCDFW.com and dallasnews.com. And voters had a role, by submitting questions for the candidates via Twitter @keranews using #texasdebates. KERA-TV re-aired the debate on Wednesday, Oct. 1, at 11 p.m. and Sunday, Oct. 5, at 4 p.m. KERA radio re-aired it on Friday, Oct. 3, at 1 p.m.
Video of the debate will be available for on-demand viewing at texasdebates.org soon after the debate's conclusion. Spanish-language translation of the debate will be streamed online at Telemundo39.com. Here's a list of TV and radio stations that will air The Texas Debates: Race for Governor. The debate was moderated by KERA managing editor Shelley Kofler. Questions were posed by a panel of journalists, including Brian Curtis, NBC 5/KXAS-TV; Peggy Fikac, San Antonio Express-News/Houston Chronicle; Norma García, Telemundo39/KXTX-TV; Gromer Jeffers, The Dallas Morning News. The Texas Debates is produced by KERA in partnership with NBC 5/KXAS-TV, Telemundo 39/KXTX-TV, The Dallas Morning News, Texas Association of Broadcasters (TAB) and other media partners. Locally, The Texas Debates was simulcast on KERA FM (90.1 in Dallas/Fort Worth/Denton, 99.3 in Sherman, 101.1 in Tyler and 88.3 in Wichita Falls). The debate included a panel of journalists posing questions. Voters also had a voice in the debate: They sent questions for the candidates via Twitter @keranews using #texasdebates. All submissions were reviewed by the KERA editorial staff. The Texas Debates originated from the studios of KERA-TV in Dallas. (Because of space limitations, the debate was not open to the public.) The Texas Association of Broadcasters funded the satellite distribution of the program to commercial and public radio and television stations statewide as a public service to media outlets in Texas. Stations had the option of taking the broadcast live or delaying it. The broadcast was available in English and Spanish and was closed captioned. The television broadcast can be heard in Spanish on the SAP channel of the debate feed. Real-time translation and closed captioning are provided by TAB, a service it has contributed for broadcast debates since 1998. KERA is a not-for-profit public media organization that serves the people of North Texas. The station broadcasts to the fifth-largest population area in the United States. KERA produces original multimedia content and news, carries the best in national and international public television and radio programs, and provides online resources at www.kera.org and www.keranews.org. KERA-TV broadcasts on Channel 13.1. KERA-FM broadcasts on 90.1 in Dallas/Fort Worth/Denton, 88.3 in Wichita Falls, 100.1 in Tyler and 99.3 in Sherman. NBC 5/KXAS-TV is the award-winning NBCUniversal Owned Television Station serving the communities of North Texas with quality news and entertainment programming on NBC 5, COZI TV (Digital 5.2) and online at NBCDFW.com. Telemundo39/KXTX-Dallas-Fort Worth is Telemundo’s local television station serving the Spanish-speaking community throughout North Texas. Owned by NBCUniversal, Telemundo39 delivers award-winning local breaking news, weather, entertainment and sports programming across a variety of platforms, including on air, online at TelemundoDallas.com and via mobile and social media channels. The Dallas Morning News Established in 1885, The Dallas Morning News is Texas’ leading newspaper and the flagship newspaper subsidiary of A. H. Belo Corporation. It has received nine Pulitzer Prizes since 1986, as well as numerous other industry awards recognizing the quality of its investigative and feature journalism, design and photojournalism. Its portfolio of print and digital products reaches an average daily audience of more than 1.1 million people and includes online news and information sites; iPhone, Android and iPad apps; Al Día (www.aldiatx.com), the leading Spanish-language publication in North Texas; neighborsgo (www.neighborsgo.com), a consumer-generated community news outlet; and Briefing, the free, home-delivered quick-read. The Texas Association of Broadcasters (TAB) is a non-partisan, non-profit, professional trade organization representing the interests of Texas radio and television stations. TAB promotes and protects a favorable climate for free, over-the-air broadcasting and educates its members and the public about opportunities and advances possible through broadcast operations. TAB is dedicated to the preservation of rights granted to the news media and individuals under the Texas Constitution and First Amendment to the U.S. Constitution. Online at www.tab.org. Learn more about the criteria for candidate participation in The Texas Debates. Note: The Sept. 19 governor's debate in Edinburg was not part of The Texas Debates. Watch the Sept. 19 debate here. To watch the lieutenant governor's debate that aired Sept. 29, click here. Republican Dan Patrick and Democrat Leticia Van de Putte squared off in their only scheduled debate.